A user-centered design vision of a visit to a NASA exhibition. Last week I was visiting a NASA exhibition in Madrid. As a usability/UX specialist, I was prepared to see complex interfaces and panels full of buttons; and they were there. But two other things related to UX were called to my attention. First, prototypes. One of the items at the exhibition was a sequence of prototypes of the lunar module that landed on the moon during the Apollo missions. Second, checklists. 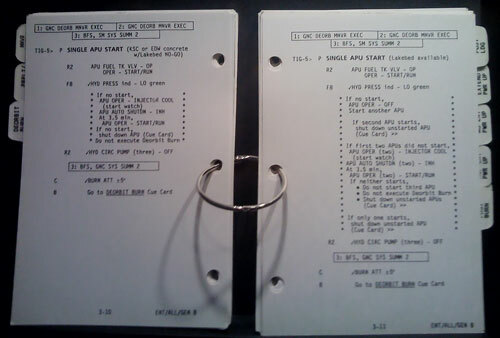 Several old-fashioned paper checklists used during space missions were shown. I don’t know whether checklists are generally considered as a usability or user-centered design technique; anyway, I think they should. For more considerations about that technique, read the surprising and interesting book The Checklist Manifesto. When we talk about usability methods, it may seem that they are some kind of magic trick or very advanced technique; but most of them are simple and based upon common sense. And they have been performed during many years. Since those kind of techniques have been performed during many years, and (most of) the missions were successful… hey, they somehow work! Members of the research community have now a way of pledging to assist only for congresses and journals that make their publications available on the web for free. Researches from institutions like Google, Microsoft and important universities have already subscribed. ‘Investigación sin paredes’, en español. When you enter the academic world, you realize of one surprising thing: it’s a rather opaque world. In fact, many of the most prestigious journals make their publications only available to subscripters, so the only part that is available on the web for free are their abstracts. So in the era of Internet and free access to information, scientific knowledge obtained through research (which should be the paradigm of free access to knowledge) depends mostly on an previous outlay. At least until now. The Research Without Walls movement allows the research community to pledge to assist in the peer review process only for conferences and journals that make their accepted publications available to the public for free via the web. Right now, the number of subscribers is not very large, but the list of institutions they belong to is pretty impressive: Google, Microsoft, Berkeley University, etc. And their prestige is important, since the reputation of conferences and journals is mostly determined by the researches that assist in them. The fact that they refuse to collaborate with closed-access publications may be a great boost to the free access to academic contents on the web.